Then you can continue with the install on a new fresh and clean drive. I run chkdsk.exe pretty often on my machines, mainly because I’m paranoid about data integrity since I have a lot of data spread across many hard drives. On my server I was trying to run chkdsk.exe on a couple of drives at once, thinking I could save myself some time. 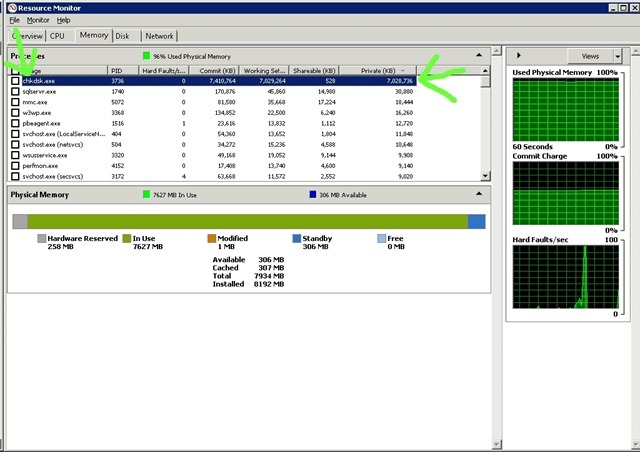 When the machine slowed down to a crawl, I started by looking at the disk utilization to see what was going on. It was expected that this would slow down the machine, but these are non system disks, physically separate from anything that should directly impact system performance. After killing two of the three chkdsk’s, I was left with the one on the “J” drive, so I decided to check disk performance with the performance monitor. Here you can see that aside from the chkdsk itself, there is some pretty significant writing taking place to the pagefile located on my “G” drive… Which shouldn’t take place since this machine has 8gb of ram and with no virtual machines running, never uses more than 1 gig. (No vm’s are running during all of this.) 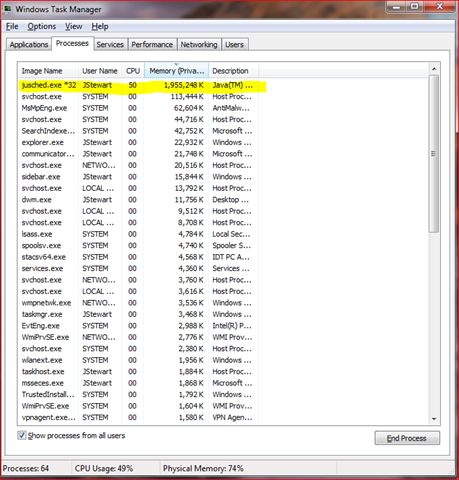 Of course, hitting the pagefile so much implies that the server is running out of memory, so let’s go see what the memory tab looks like. 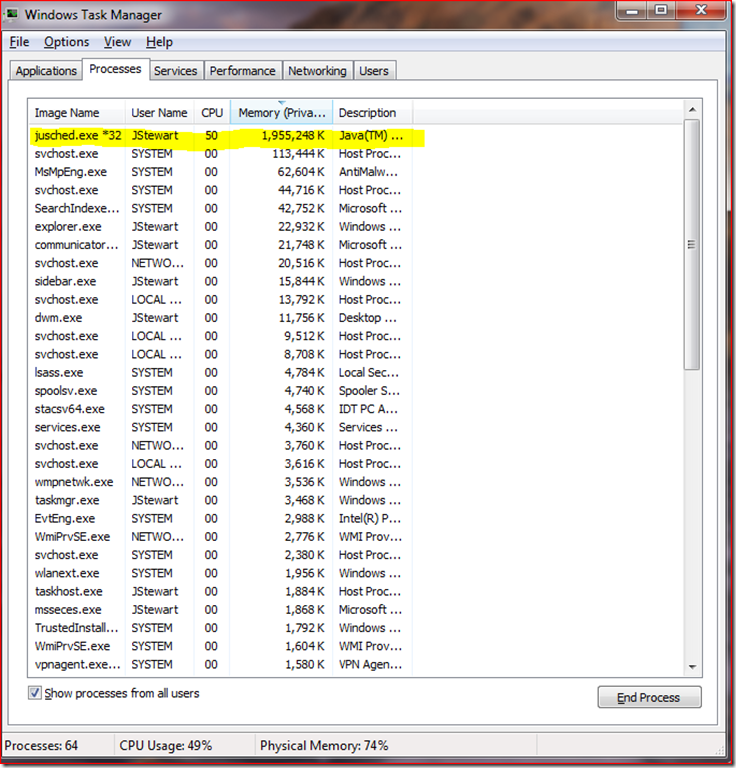 Here you can see that there is 0 free memory (as in zero)! 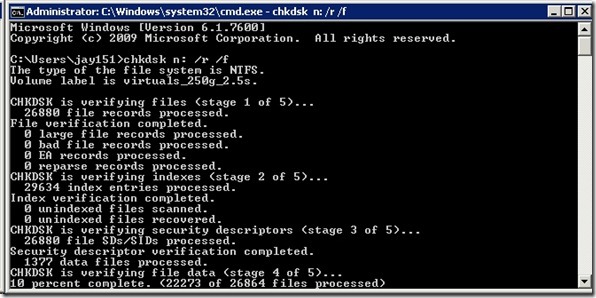 Then you can look at the processes and see that chkdsk.exe is using 7.0 gigs of memory! What? This must be a bug.. a leak.. right? Something must be wrong. Well, guess what? Apparently this is by design… from what I have been able to gather after reading various forums and blogs, the w7/2008 server version of chkdsk will use all the available ram in an attempt to speed up the chkdsk. Here’s a Microsoft article that mentions it. Now there has been a lot of sky is falling type talk over this subject, and there are many people who have stated that their machines crashed as a result of this. To be clear in my case the machine does continue to function, although it does it very slowly. In my opinion, this behavior, even if by design, is very bug-like and mimics a memory leak in every way, just without the crash at the end. (And the memory clears up when chkdsk is done.) This seems like an odd way for Microsoft to design this, and I would prefer some other way to limit the ram used by this process. I replaced all of the incandescent bulbs in my house about 2.5 years ago with CFL’s in an attempt to save energy and be “green”. Unfortunately, the burnout rate on the bulbs that Home Depot and Costco are selling aren’t just high.. they are so high that it makes these bulbs a total ripoff that costs you more money in the end. Here’s a site with some reviews. Similar model (not flood) with similar reviews. These bulbs were also UNQUALIFIED from the energy star compliance list. Here’s someone else with some failure info. Here’s a good thread with pictures and some technical explanations. More info on CFL failures. Basically what I did was make the “host key” in Microsoft Virtual PC 2007 the left control key. (Seemed like a really good idea at the time.) Sometime after this, copy/paste stopped working reliably… eventually it occurred to me what I had done- by making the left control key the host key, I had broken my copy/paste key combo. Don’t do this! 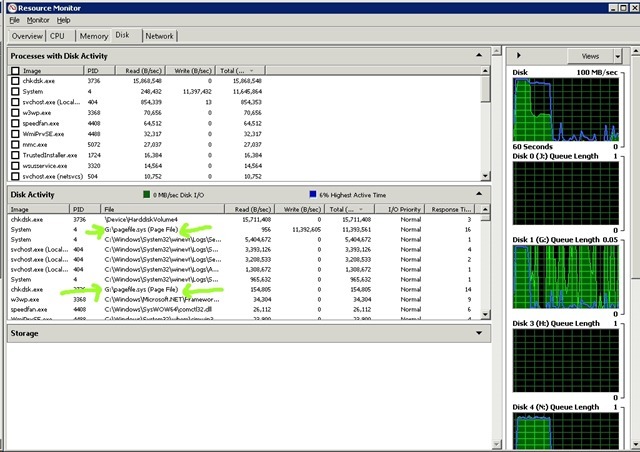 I found a couple of strange problems sharepoint 2007. Even though you are a site administrator, collection administrator, everything, when you click on “user profiles and properties” under your shared services ssp, you get an “access denied”. I found this fix that someone else posted. I recently learned thought I learned that my water heater had gone south. This was expected, due to its 13 years of age and II had found rust in my water. Since I consider myself smart enough to look at the long term benefits of something, even if the initial cost is greater, I decided to look into a tankless water heater. Research showed that they were supposed to save anywhere from 15% to 40% on your gas bill every month, last longer, etc. You also get a tax break and a credit from your local energy company (in most cases) so it seemed like a no brainer. Aside from the initial cost being greater, the advantages looked great. After some research, I found out what size I needed, and they they seemed to pretty much all have the same features and prices, so I went to lowes and picked up a Bosch 2400 (only because I had a 10% off coupon). Since I’m pretty handy around the house (I will not pay someone else to do something I can do on my own) I decided that with some help from my brother, we could install this thing no problem. Before I bought the thing I did some research and found out that tankless heaters require updated exhaust venting, but I couldn’t found out too many of the details around it. After some reading online and scanning through the manual, it looked like what was needed was just dual walled exhaust pipe, which is code (almost?) everywhere now, and since this is what my house already had, we got the stuff to tie into my regular exhaust vent. We even found a couple of write-ups online (I will look later and link them if I can) where others had done this. After reading the manually carefully though, and after a call to the Bosch 800#, I realized that in order to meet code, I would have to use the stuff that the manufacturer recommends, which is a stainless pipe that is sealed with a gasket. So.. I go back to lowes and get their install kit, which is $230 and includes about 4′ total of pipe. In order to get to the side of my house, I would need about 12′ of straight pipe in addition to this stuff. This was going out the side of the house instead of from the basement through the roof like the old exhaust vent ran since I also found out that the water heater can’t share an exhaust vent, it must have its very own. The pipe is special order at Lowes (and Home Depot for their brand I found out), so I went looking locally at the plumbing supply houses. In the end I learned that the exhaust pipe is mostly brand specific, and that no one carried anything locally. After some looking online again, I found the pipe for a price of $50 for a 4′ section online! This means that venting to the closest place I could, I would be out about $400 total. Ouch. In the interim, I installed the unit and vented it to my existing exhaust pipe, while I waited on the ordering and shipping process to take place. So… we had hot water! ..and I went to take a very much needed shower. While showering, the water kept getting hotter and hotter, and while I was all soapy, the water got very cold, there was no hot water! After fuming about it for several minutes and rinsing off in cold water, the water came back hot again. What?! The next day I called Bosch and they told me that the temperature was adjusted too high, and what was happening was that I would turn the hot water so low during the shower because the temp was so high, that it would fall below the minumum flow rate needed to make hot water, so the heater would stop. Their answer was to turn the temperature down, which I did, and it didn’t help. Turning on a hot water faucet in a sink temporarily relieved the problem though, since it kept the flow rate up enough, and everything worked. I troubleshooted it a bit and finally realized that the heater was making water that was 145 degrees, no matter what the setting… it was a bad heater. Great! So I did some more research and found out that Bosch isn’t one of the best brands out there, and lots of people had problems. Strangely enough, I didn’t see this beforehand. So off I went to Home Depot to buy their tankless product instead, I had it on the cart and was getting ready to leave when I realized that it required 4″ exhaust piping instead of 3″… meaning that I would have to buy 4″ pipe and adapt that to the 3″ pipe which was already in my house, and it was then that I decided this wasn’t meant to be. This was just too much trouble. In the end it took me about 2 hours to mount up the new tank water heater. It is a Whirlpool Energy Smart. I had hot water in about 30 minutes, it is working great, and I haven’t looked back. Lowes was nice about returning the tank heater and various bits and pieces. In the end with all the returns and whatnot (some of the stuff I couldn’t return), my new water heater cost me $908. My hope is that this one works out. If I had just gone with the tank heater in the beginning, I am sure I would have saved myself time and money, probably a couple hundred dollars at least.